And in order to lead he must be able to speak in some manner. 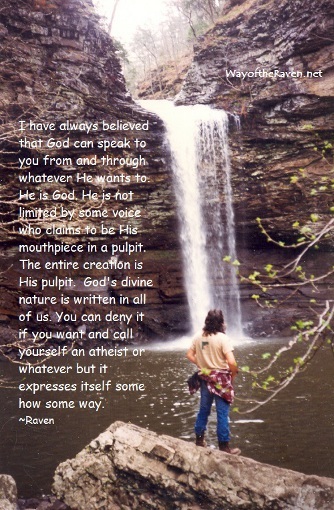 I do not believe God is a mute. I have always believed that God can speak to you from and through whatever He wants to. He is God. He is not limited by some voice who claims to be His mouthpiece in a pulpit. The entire creation is His pulpit. God has even spoke to me through so-called secular movies, even a commercial on TV one time and definitely many times when I have been out in nature. God’s divine nature is written in all of us. You can deny it if you want and call yourself an atheist or whatever but it expresses itself some how some way. This expression is TRUTH. Not your truth or their truth but TRUTH. Truth by design should set one free not put one in a cage. To try to contain truth and conform it to captivity only produces other caged animals. To try to contain truth is cruel, it is against its natural design and eventually will only weaken as it loses its wild side. To try to contain truth in a temple or to even try to organize it under one roof/one people/one set of beliefs is like caging a wild animal. Real truth is big enough to cover all of creation. 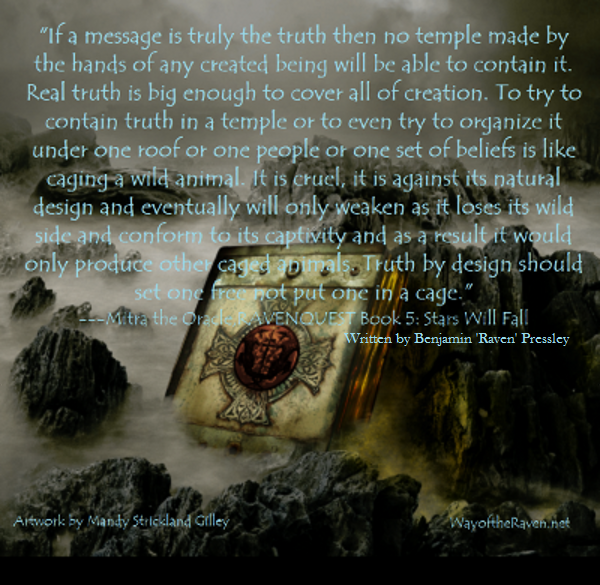 If a message is truly the truth then no temple made by the hands of any created being will be able to contain it. Through time people have come up with some pretty strange ideas of what truth is. If something is truth it will fit ALL people for ALL time. I have came to this conclusion. Truth is embodied in a person: Jesus. Jesus came to save and restore people to a RELATIONSHIP with God for ALL people for ALL time not to start another religion. He was a man that was more than a man. He was and is the Creator of all things and as he viewed all the things that people were saying was truth he loved us enough to come and explain it to us humans one more time and guide us back to the path we should be on. 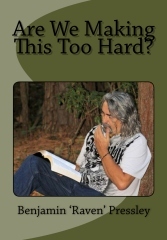 It was explained back in the Garden of Eden to not take on the burden of deciding what is good and what is evil. He knew it would only lead to moral relativism and a million religions claiming they had the truth. That is what his command to not partake of the tree of the knowledge or good and evil was all about, not just a fruit, not just disobedience; He was trying to do us a favor and was basically saying, ‘Turn to me when you need to know what is right and wrong, good or evil. You can trust me.’. The devil’s lie that still is at the heart of why so many walk about in confusion is that God can’t be trusted (“Hath God said?” Genesis 3:1). Jesus alone FULFILLED all the prophets and religions and declared that HE was the Way, the Truth and the Life (John 14:6); not just another way, truth or life. He alone could claim this because he was not just a man but God/Creator become man. Till we accept that the TRUTH became flesh and dwelt among us EVERYTHING else is just a powerless substitute. ALL people need a savior. We cannot save ourselves. Only one figure in history was completely impartial and willing to die for all: Jesus. Religion is nothing more than MAN creating God into an image that suits them and approves of their selfishness and prejudice. Anytime people try to create a system of serving God they fall out of relationship and intimacy with God. Those who are in a TRUE relationship with their Creator know they are loved, accepted and have no need of a religion or a prophet’s approval. Relationship and Truth are about giving. Only TAKERS need a religion to justify their evil. People that live in harmony with all things know everything they do is a prayer. We need to rid our consciousness of ALL religions and trade it for a RELATIONSHIP with God, people and all creation. Truth of the matter is even People who form religions around Jesus are just as evil than those they condemn with their self righteousness. 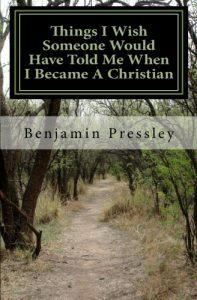 Jesus did not come as just another prophet or religion. Be sure of what you believe. 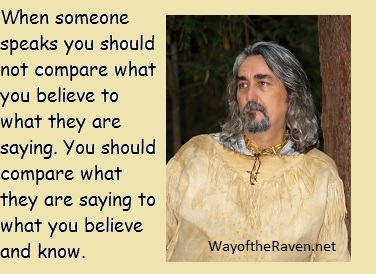 When someone speaks you should not compare what you believe to what they are saying. You should compare what they are saying to what you believe and know. When you enter a room everyone in the room should feel the weight of who you are and deal with it. Truth is though we live in a world of many, we really are just one. From the beginning of creation it has always been so. Man of earth, woman of man, child of woman….a continual cycle of oneness. A beautiful thing. Introduce into that equation the lie. Not just A LIE, but THE LIE that you cannot trust your maker then all comes tumbling down. Every human being has something to contribute. We must consider and treat ALL human beings equally. NO prejudice is appropriate. EVERY living thing has a part to play. Eliminate at will and how it suits our model of self service, greed and the corporate machine and we get…well, what we got, a planet in crisis. We have got to get over this TAKER mentality if this planet is going to survive. Humans were meant to LEAD this planet not conquer and subdue it to fit the greed flavor of the day. Fact is Humans are NOT the center of the universe. The Earth does not need us. We need the Earth. It isnt ‘all about us’. Christ called us to oneness and truth, to learn from others and give them equal love and respect and not to have a ‘cookie cutter’ mentality of what people look and act like. We must develop a world view that does not elevate ourselves above any creature. Personally, I think people were more human when they lived closer to animals and nature…especially animals! The world we have created, at least in this western civilization, is a well insulated illusion labeled ‘It is all about us’. We have built walls we somehow believe are impenetrable. We think our new ideals and morality is expanding our universe yet the reality is there are cracks in the sky and under our feet that we think if we ignore long enough will go away but the reality is it is collapsing all around us. We must judge all people as individuals and get to know them on their own merit and consider all human beings a community with much diversity but human nonetheless if we are going to survive. These days people not only want you to accept their lifestyle, political orientation, religious affiliation, etc…. but to also praise it. Personally, I will not be a part of celebrating someone’s gayness, religiousness, color, gender, etc. Racism, as an example, will never go away as long as we acknowledge someone as another race. We give power to things in this world that we should not. Our power should be consumed in treating one another as we would want to be treated. 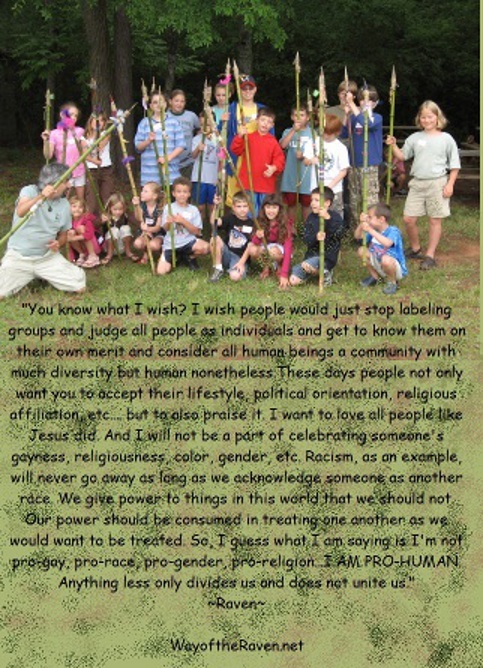 I’m not pro-gay, pro-race, pro-gender, pro-religion…I AM PRO-HUMAN. Anything less only divides us and does not unite us. The modern day institution we know as ‘church’ is in a way history repeating itself with the complicated, controlling institution the Pharisees had going. Enter a young rabbi that was more than a man, He was the Son of God, rocking the boat of tradition actually doing ministry not sanctioned by the temple. Enter the 1st century church rocking entire governments. Rome didn’t care how many religions there were as long as they played along and didn’t cause any trouble, as long as they could control them like they did the Jewish temple and traditions. God broke out of the imaginary box that people imagined they held Him in and He will always break out of the box. God will always shatter and challenge our comfortable illusions. How about you? Are you willing to have your illusion shattered? Are you willing to hear the truth instead of living in a world where you choose your illusion? Are you willing to search your soul and pray as King David of Israel did in Psalm 139:23-24, “Search me, O God, and know my heart: try me, and know my thoughts: And see if there be any wicked way in me, and lead me in the way everlasting.” Ah, there is the rub! Are you willing to look into the mirror of of your soul and see yourself for who you really are? Are you willing to take that journey within deep into the darkened woods of your mind, deep into the darkened woods of your life, deep into the darkened woods of religion, philosophy and life in general? 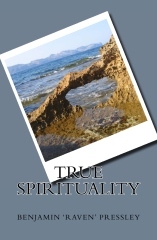 Do you dare to go deeper than you have ever gone before, to challenge your mind and learn to bring your spirit to life and listen….really listen, maybe for the first time, to the spirit inside us all? James 1:23-24 puts it this way: “If any be a hearer of the word, and not a doer, he is like a man beholding his natural face in a glass: For he beholds himself, and goes his way, and straightway forgets what manner of man he was.” In other words look into the mirror, examine yourself with the mentality and willingness to see the evil in YOU not someone else and then do something about it! You are fooling yourself if you are not going to act on what you see that your spirit will reveal and to make the changes needed as they are revealed. One of the most profound truths I ever realized is the truth that I can’t change anyone except myself. Stop trying to change everyone else to fit what you think they should be. If you think you have to change someone then please don’t torment another human being with your selfishness. Just move on. Continue on your journey. This is especially true when it comes to love relationships. How will you know when the right one comes along? The right one will build you up. They will be a giver and not a taker. Love is never performance based. Love is selfless. Lust is selfish. Never give yourself to someone because you think you NEED them or they need you. Build a life where you need NO ONE then when the right person comes along it will be a powerful partnership. 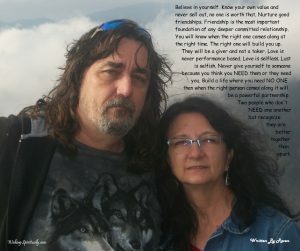 Two people who don’t NEED one another but recognize they are better together than apart. And lastly let me say, Let the warrior arise within you. It is there inside all of us. It is that part of you that says ‘No more!’ It is that part of you who is willing and able to do what needs to be done. It’s that part of you who refuses to be kept down and held back. It is that part of you that is screaming for vengeance against the years you have been beat up, held back and put down. There is no one to blame but yourself. Sure life can be tough and maybe you have been victimized by someone or something but are you really going to let that tie you down and hold you back any longer? Set the warrior free in you. You are the only one that has the key to the jail that you find yourself in. Yes, you. It really is up to you. It is time some of you make some hard choices. It is time some of you reevaluate what is working in your life and what is not working. It is time some of you repent, change and forgive. It is time some of you started over with a new place and a new name. It is time some of you got some toxic people out of your life. It is time some of you stopped being religious and be spiritual. It is time some of you stop limiting yourself. Pray about it, ponder it and when you know it is right cross that bridge and only look back long enough to smile and strike that match to burn that bridge behind you and then don’t ever look back! I am really sick of so much human potential on our planet being limited by racism, bigotry, fear, upbringing, believing the media, that voice put in your brain by some cruel parent or teacher as a child, religion….and the list goes on! Stop limiting yourself. Forget who THEY say you are (Whomever THEY are). Read. Watch motivational videos. Lose that weight and more importantly lose the weights that keep you down. Take that leap. Reevaluate that job you have settled into; is this really what you wanted to be when you grew up? Grow up. Stop blaming others. Surround yourself with people who build you up. End toxic relationships. Write that book. Teach. Learn. Empower yourself. You are on a journey…Make it count! 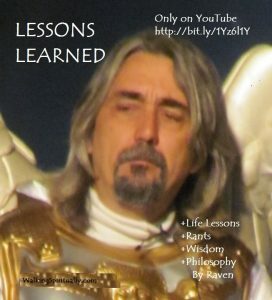 HAVE YOU VISITED MY YOUTUBE CHANNEL ‘LESSONS LEARNED’? Many topics discussed such as marriage, parenting, community, the power of our words and thoughts and much more! 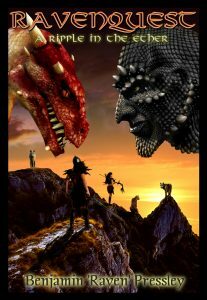 RAVENQUEST— A journey you will never forget! 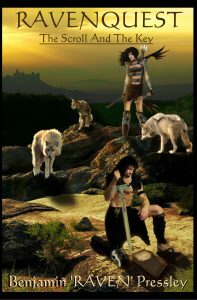 7 volumes of action packed, inspiring fantasy! The dark place…It is never an easy place to be. The trail before me looks dark and foreboding like a walk through the woods into the night. I am not even sure how I got to this place. Then I hear the squawk of a raven and up ahead I am sure I see the silhouette of a wolf. My heart races, sweat breaks on my brow, I swallow deeply….and then I do that which is against all logic: I step boldly into the darkened wood and suddenly the wolf runs toward me…the raven, he flies toward me…yet somehow, I am not afraid. The raven lights upon my shoulder, the wolf comes to my side and the wind does blow all about me seeming to surround me and embrace me. They speak and for the first time in my life….I feel peace! Then I feel the wind all about me. It is as if it blows through my very soul. And somehow I feel refreshed and one with all things. “ We are three yet we are one. And behold I show you another mystery for you are one in us as we journey together. “ And so we journeyed ever deeper into these woods and somehow I knew these woods were more than woods for this was a journey into spirit, soul and body yet immersed into the imminence of the One who leads us. And somehow though they led me I knew that I was one in them and they in me. 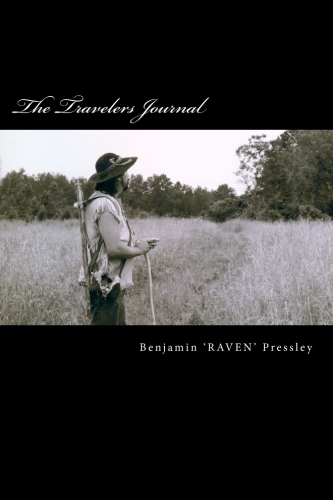 RAVENQUEST—The most amazing memorable journey adventure you will ever read! You will smile, laugh and cry. 7 volumes of action fantasy! RAVENQUEST—Exciting fantasy adventure! A journey you won’t forget! Now in 7 volumes! I knew I was about to experience the journey of a lifetime and indeed it was a journey of my lifetime. There was no crowd around me, no it was just me and these holy guides. I was not alone but in this realm that I journeyed in I knew no one else could walk this path for me and though I would meet others along the way we each had our own paths to walk. Our meetings would be but intersections along the way though our paths would even be beside one another at times still their path would be theirs and my path would be mine. My thoughts were my own yet they were not my own. It was as if my mind had merged with a larger mind. “Indeed it is so.” I heard the voice of the wolf, the raven and the wind say for their voice was one. NEXT BLOG WE CONTINUE OUR SERIES ON RELATIONSHIPS! SUBSCRIBE SO YOU DON’T MISS OUT!